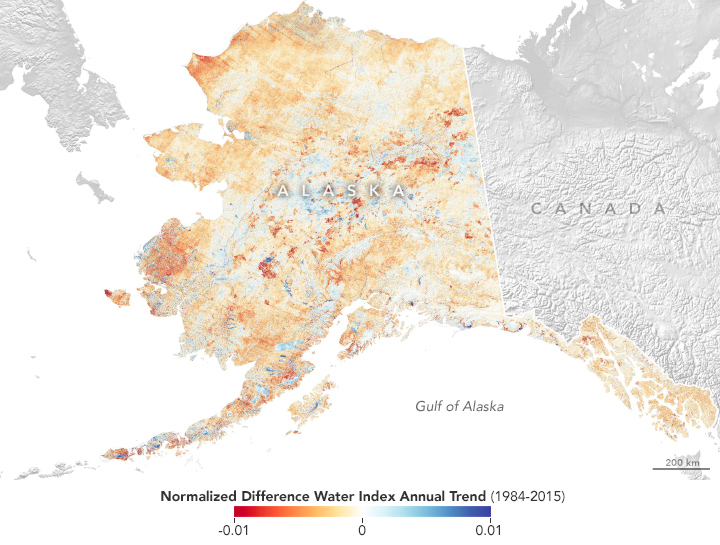 About 13 percent of the Alaskan landscape has changed in some way in recent decades. That’s the conclusion of a 2018 study led by Neal Pastick, who examined historical aerial photos and satellite images to identify areas of ecological change across the state. The most notable changes in Alaska include the browning of land from forest fires and the greening of the land as vegetation regrows. Pastick also documented vast areas of land affected by erosion, including segments of coastline that have dramatically changed shape. 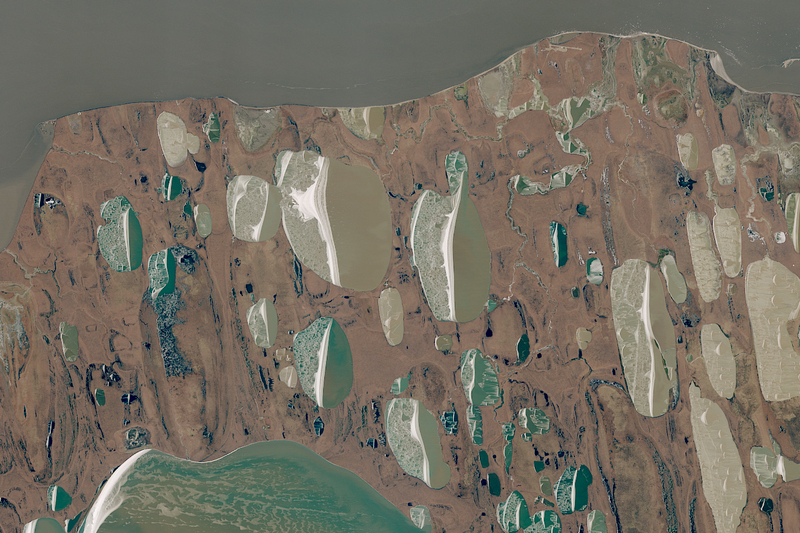 The images above show how erosion has eaten away at the northern coast of Alaska. They were acquired by the Landsat 4 satellite on July 8, 1992 (top), and the Landsat 8 satellite on October 5, 2018 (bottom). Use the image-comparison tool to note the retreat along the coast just east of Drew Point and north of the airport. 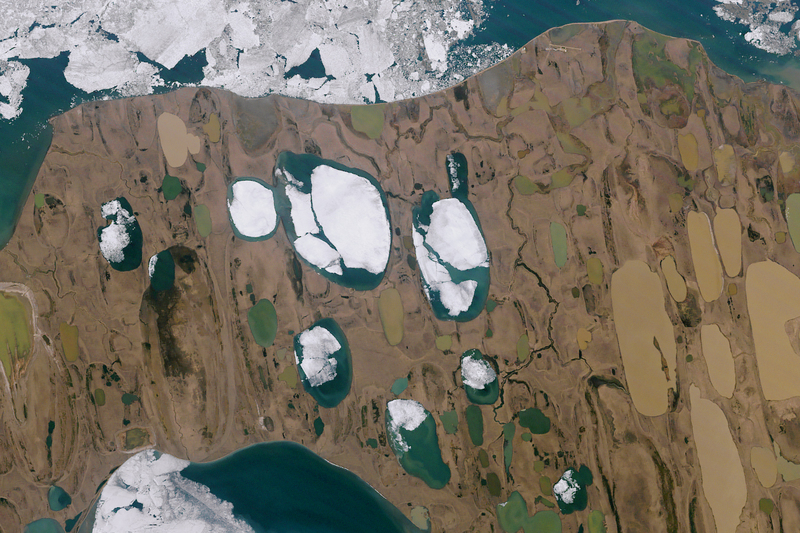 (Note that changes in ice cover between images reflect a long-term trend, but also simple seasonal differences.) “This is a pretty extreme example of coastal erosion in Alaska,” Pastick said. Warming temperatures have played a major role in the coastline retreat. Melting permafrost leaves the ground less stable and more prone to being washed away by heavy rains and pounding ocean waves. Rising temperatures cause the protective sea ice cover to disappear for longer periods each spring and summer, meaning waves and Arctic storms can more easily chew away at the coastline. 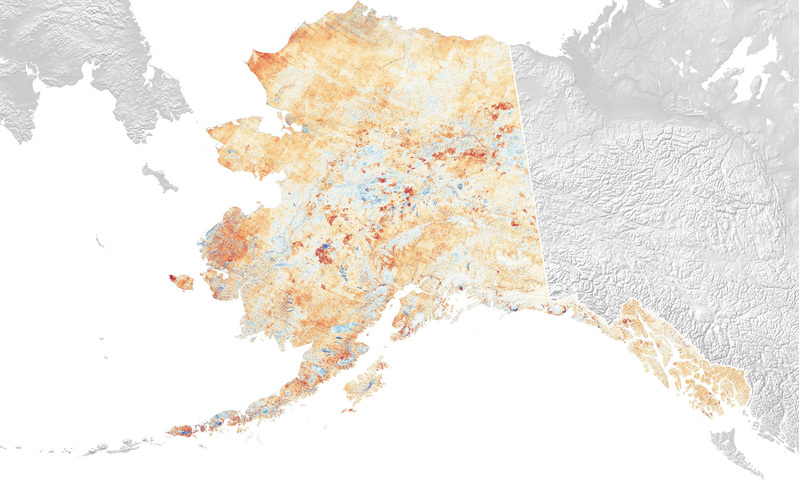 No one lives along the receding coastline shown above, but coastal communities elsewhere in Alaska have had to make decisions about how to deal with failing infrastructure as permafrost melts and coastlines retreat. Pastick and colleagues used satellite and aerial photograph comparisons to verify the type of ecological change responsible for broader trends in the landscape. For example, the map above shows the median change in the landscape’s wetness per year between 1984 and 2015. Analyzing all of the information together led them to conclude that 174,000 square miles (451,000 square kilometers) of the Alaskan landscape has undergone change. Pastick, N. J. et al. (2018) Spatiotemporal remote sensing of ecosystem change and causation across Alaska. Global Change Biology, 1–19. NASA Earth Observatory images by Lauren Dauphin, using Landsat data from the U.S. Geological Survey and NDVI and NDWI annual trend data courtesy of Neal Pastick. Story by Kathryn Hansen. This image record originally appeared on the Earth Observatory. Click here to view the full, original record.